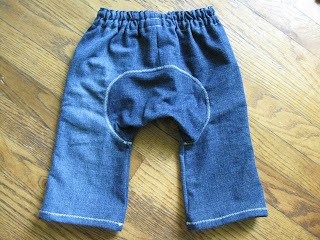 I made another pair of recycled baby pants for little guy. 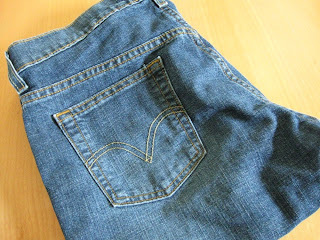 This time I used an old pair of my jeans. I used the monkey pants pattern again, but with additional modifications for non-stretch woven fabric. I got the pattern right this time and it worked out great. All the pieces went together very nicely and the pants turned out super cute. I am really excited to use the pattern again. I think I am going to try to make shorts next. Very cute and I love recycling fabric! Hi Darlene, just found your blog here via Melissa's facebook comment, great stuff here! Once I found out I was pregnant, I, too, started saving my old clothes instead of giving them away so I could have fun fabric to use to make baby clothes. But I haven't actually gotten around to it (until I master sling breastfeeding, I can't spend too much time at my sewing machine. . .) so I'm living vicariously through your blog, gathering ideas for the future! Thanks so much! So glad you found the blog and are enjoying the posts.